Canker worms begin making their way up hardwood tree trunks in the Fall to lay eggs for a Spring outbreak. The most effective way to stop the migration is to apply a band of Tanglefoot around the tree trunk. This will stop the females in their tracks. 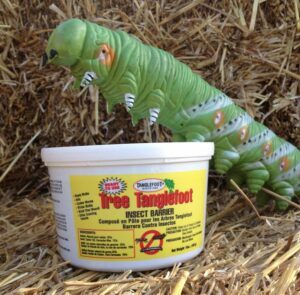 This 5 pound tub of Tanglefoot is ready to use and will provide a sticky barrier against canker worms, ants, winter moths, black vine weevils, and other crawling insects. Will also stop little boys from climbing your trees. Sticky Stuff!